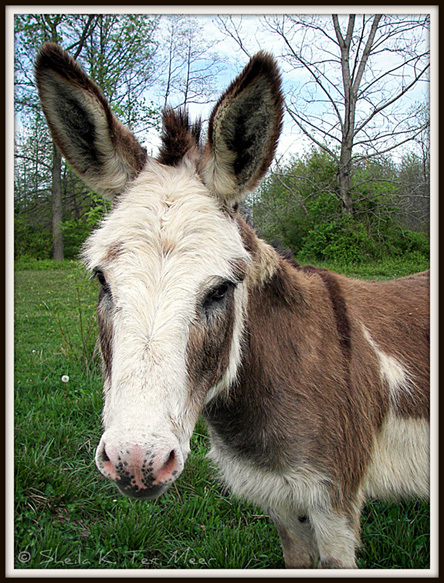 This little donkey seemed so friendly. I think he thought I was going to feed him. The two horses in the pasture bolted but he came right up to the fence and stuck his nose all up in my business. I tried stepping from side to side to get a good profile, and hopefully good eye to eye contact, but when I moved right, he moved right. When I moved left, he moved left. I think he wanted to eat my dangling lens cap. When I didn’t deliver, he gave me this “donkey on the edge” look, so I took the shot, said “That’ll do, donkey” and in two shakes of a donkey tail, I bolted. Sheila T Illustrated finally hit the 100 mark! Before I proceed with this post, I want to thank each and every one of my readers … you know who you are … for all your comments, advice, tutorials, compliments and validation! To mark this milestone in the life of my blog, I’d like to give Extra! Extra! recognition today to my 100th reader: Golappan on WordPress at ClickdPic. Golappan is from India, presently working in Dubai. He has only been blogging since March and already has half the all-time views it took me 6 months to achieve. I don’t know how many followers he has, but I encourage my other 99 WordPress and 5 comment readers to check out his blog – in particular, an excellent slideshow on his grandmother’s village.